Shield cutout for shield style badges. Features sturdy metal clip for pockets or belt. Dimensions 2.50" x 3.50". Thought it would be recessed enough to encase badge. Perfect fit but very narrow cut out. This is a good buy for when you need it off duty. Great price and tis does the job fine. Excellent, quality product at a great price. My Shield Badge Clip is excellent I will in the future order some more gear, you have the best... Thank you very much. Will this holder fit a more square shield rather than a long one? 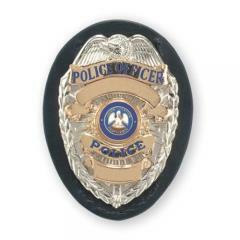 This is a shield style badge holder with a dimensions of 2.5" x 3.5".